Dance with Me was not at all what I expected. I thought a cute little story about a little girl that loved to dance. But it’s really about a little ballerina that lives in a music box! Penny Harrison takes us into the world of the little ballerina. The ballerina lives in a wooden music box and there’s a little girl that loves to dance with her. Over the years, the little girl grows up and doesn’t dance with the ballerina. One day, the ballerina decides to take off and try and find someone to dance with her. The first animal the ballerina comes across is a bumble bee! But he’s too busy to dance. Then she comes across a sand turtle. The sand turtle informed the ballerina they don’t dance. And as she was boating across a lake the ballerina came across a leopard! She thought for sure she had found someone to dance with. But the leopard wanted to eat her! So the ballerina danced as quickly as she could back to her music box. When the little girl came home, she shut the lid on the music box and put the box away. The ballerina spent so many years locked away in a closet. Until one day, the music box was opened. And there was a little girl! A little girl that looked very similar to the little girl from years ago. And together they danced. Penny Harrison takes you on an emotional ride with this story. At first, I was confused, then sad and then happy. It was not what I had expected. Peyton enjoyed the story because she loved seeing the ballerina meet new animals and take an adventure away from her music box. And she thought it was really neat that the music box was handed down to the little girl’s daughter when she grew up. Dance with Me is a story about growing up and how life changes. 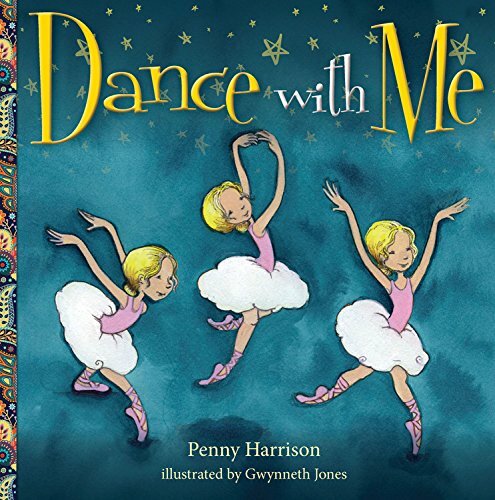 You can purchase your own copy of Dance with Me online or at your local bookstore.